Home › Bankruptcy › What Is My Median Income For Bankruptcy? What Is My Median Income For Bankruptcy? The median income is a very important number for debtors to consider when considering whether to file for bankruptcy. A bankruptcy attorney can assist you through this process and provide you with the most up to date information. 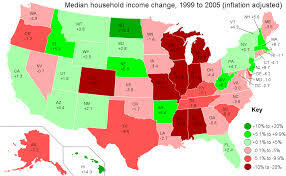 Every so often the United States government releases updated median income information for every state which you can find HERE. In order to qualify for a chapter 7 bankruptcy without passing the means test, a debtor must below the median income for their family size based on their last 6 months of gross income multiplied by 2. This means, at least this time around, those who may not have qualified in April may qualify for a chapter 7 bankruptcy in May in Washington State as the numbers have gone up for the most part. The current median income in Washington state is for a single person is $53,302 and for a household of two is $63,873. The numbers increase for each additional member of the household. The median income may come into to play for those seeking to file for chapter 13 bankruptcy as the median income will affect the means test and ultimately the payments that debtors may have to make in a chapter 13 bankruptcy. The higher the median income is for a state, the lower the payments of the debtor will be as they will not have as much disposable income available to put towards debts if they need to use the money for everyday living expenses. In general, if you are trying to lower your payments in a chapter 13 bankruptcy, you should file at the time when you think your income will be the lowest over a 6 month period. Therefore if you think you will not be working as much in the future, you should wait a couple of months to file your case to maximize the lowest payments or maybe even qualify for a chapter 7 bankruptcy. ‹ What You Should Look For In a Debt Settlement Attorney?